November 12, 2018—The Chicago Film Critics Association (CFCA), the Chicago-area print, online and broadcast critics group that has celebrated the art of film and film criticism for over 25 years, is pleased to announce the dates and location for the 7th Annual Chicago Critics Film Festival (CCFF). 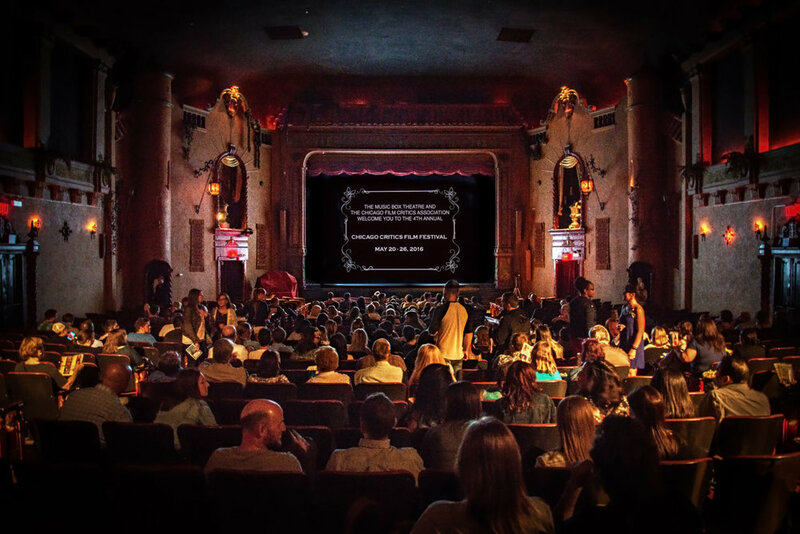 The festival will run from May 17-23, 2019 and will once again take place at Chicago’s historic Music Box Theatre. The event, voted first runner-up for Best Film Festival in the Chicago Reader’s 2017 “Best of Chicago” poll, annually features a selection of acclaimed films chosen by members of the organization, a combination of recent favorites from the festival circuit and as-yet-undistributed works from a variety of filmmakers ranging from established favorites to highly promising newcomers. It is the only current example of a major film critics group that hosts its own festival. Over the past six years, the festival has given Chicagoans the opportunity to see the some of the year’s most talked-about films weeks or even months before making their official commercial rounds. The 2018 installment alone saw the local premieres of such acclaimed films as Eighth Grade, First Reformed, Leave No Trace, Three Identical Strangers, Searching, Revenge, Bodied, Madeline’s Madeline and a special 25th anniversary screening of Jurassic Park plus appearances from the likes of Paul Schrader, Bo Burnham, Joseph Kahn and Gugu Mbatha- Raw. The CFCA has always been dedicated to supporting and celebrating quality filmmaking that has something to say about our world, our lives, and our society. In the past, while it supported and fought for the continued role of film critics in the media, the CFCA's primary public interaction was through the announcement of its annual film awards each December. In recent years, however, the CFCA moved aggressively to expand its presence on the Chicago arts scene and to promote critical thinking about cinema to a wider base. In 2012, in addition to re- launching a late-winter awards ceremony, CFCA members presented numerous film screenings at theaters like the Studio Movie Grill in Wheaton, and Muvico Theaters Rosemont 18 in Rosemont, Illinois. CFCA members also team-taught a new Young People's Film Criticism Workshop at Facets Multimedia that emphasized not just film analysis and criticism, but also writing skills to middle-and high-school students, many of whom were attending the course on lower-income scholarships. With this film festival, we intend to take the next step.